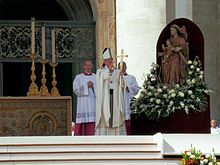 Monsignor Guido Marini (born 31 January 1965) is an Italian priest of the Catholic Church, who has been the Master of Pontifical Liturgical Ceremonies since 1 October 2007. Pope Francis has extended his appointment to 2022. He previously served as chief liturgist for the Archdiocese of Genoa. Marini was born in Genoa on 31 January 1965. He earned his B.A. in theology at the seminary in Genoa and was ordained a priest on 4 February 1989 by Cardinal Giovanni Canestri. He then earned a degree in both canon and civil law (JUD) from the Pontifical Lateran University and another degree in the psychology of communication in 2007 from the Salesian Pontifical University. In addition to working as a spiritual director, he held the following positions in Genoa: secretary to the archbishop of Genoa from 1988 to 2003; master of liturgical celebrations from 2003 to 2007; member of the archdiocesan Council of Priests from 1996 to 2001; spiritual director of the seminary in Genoa from 2004 to 2007; and Chancellor of the Archdiocese from 2005 to 2007. Marini was named Master of Pontifical Liturgical Ceremonies on 1 October 2007, appointed to another five-year term by Benedict XVI, confirmed in that office by Pope Francis in April 2014, and appointed to another five-year term in 2017. Francis also named him a member of the Congregation for the Oriental Churches on 19 February 2014. Marini, following his appointment as Master of Pontifical Liturgical Celebrations, restored some traditional elements of papal ceremonial. During his time as Master of Ceremonies the Papal Altar was rearranged. The seven candles and crucifix were placed in a line across the Altar rather than clustered on the sides. This arrangement has become known as the "Benedictine arrangement". In a January 2010 speech, Marini supported calls in the church for a "reform of the reform" of liturgy. He said: "For some years now, several voices have been heard within church circles talking about the necessity of a new liturgical renewal," adding that a new renewal movement would be "capable of operating a reform of the reform, or rather, move one more step ahead in understanding the authentic spirit of the liturgy and its celebration." In 2015 Pope Francis made changes to the public ceremony of investiture of the pallium on metropolitan archbishops emphasizing that the investiture is an ecclesial event of the whole diocese, and not merely a juridical or ceremonial event. Monsignor Marini said that from now on – starting from 29 June this year – the ceremony of investiture of the pallium will take place in the Metropolitan Archbishops' home dioceses and not in the Vatican. During Marini's time as Master of Ceremonies Pope Benedict ceased to use the papal staff made for Paul VI and began to use an older one made for Pius XI. Due to the weight of that staff, Benedict had his own made which is much lighter, and shares a similar style with the previous one. Pope Francis occasionally makes use of this one also in order to emphasize continuity with his predecessor. He also made decisions about the use of papal vestments at Mass and other pontifical celebrations, dressing Cardinal-Deacons in dalmatics when serving pontifical celebrations. Marini was Master of Ceremonies in the 2013 conclave that elected Pope Francis. On 11 March 2013, the day before the conclave, at a ceremony presided over by the Camerlengo Tarcisio Bertone, Marini led the non-cardinal officials, support staff and other non-elector personnel with duties in the conclave in taking an oath of secrecy pertaining to the conclave. The next day, after the cardinal-electors had taken their oath in the Sistine Chapel, Marini called out the command "Extra omnes" (Everyone out) and closed the chapel doors once all outsiders had left the chapel. Liturgical Reflections of a Papal Master of Ceremonies, Newman House, 2011; a collection of essays. ^ a b c Tornielli, Andrea (22 December 2017). "Il Papa conferma il suo cerimoniere Guido Marini". La Stampa (in Italian). Retrieved 22 December 2017. ^ a b "Rinunce e Nomine, 01.10.2007" (Press release) (in Italian). Holy See Press Office. 1 October 2007. Retrieved 22 December 2017. ^ Glatz, Carol (14 April 2014). "Pope names woman president to papal academy, confirms papal liturgist". National Catholic Reporter. Catholic News Service. Retrieved 22 December 2017. ^ "Rinunce e Nomine, 19.02.2014" (Press release) (in Italian). Holy See Press Office. 19 February 2014. Retrieved 22 December 2017. ^ "Papal liturgist endorses 'reform of the reform' of the liturgy". Catholic News Service. 7 January 2010. Retrieved 7 March 2013. ^ "Pope modifies and enriches Pallium Investiture Ceremony". Vatican Radio. 29 January 2015. Retrieved 12 January 2017. ^ "Normas Nonnullas" [Certain rules]. Libreria Editrice Vaticana. 22 February 2013. Retrieved 2 February 2014. ^ Non-voting participants in conclave take oath of secrecy (Television production) (in Italian and English). Rome: Rome Reports. 12 March 2013. Retrieved 2 February 2014. ^ Conclave oath of secrecy (Television production) (in Italian). Catholic News Service. 11 March 2013. Retrieved 2 February 2014. ^ "Notificazione Giuramento degli Officiali e addetti al Conclave" [Oath of the Officials and the Employees at the Conclave] (Press release) (in Italian). Office for the Liturgical Celebrations of the Supreme Pontiff. 9 March 2013. Retrieved 2 February 2014. ^ Conclave begins behind closed doors, as the famous 'Extra Omnes' phrase is announced (Television production). Rome Reports. 12 March 2013. Retrieved 29 December 2017. ^ Unterseher, Cody C. (19 June 2011). "Book Review: Liturgical Reflections of a Papal Master of Ceremonies by Guido Marini". Pray Tell Blog. Retrieved 23 December 2017.